Upper endoscopy helps your doctor evaluate symptoms of upper abdominal pain, nausea, vomiting or difficulty swallowing. It’s the best test for finding the cause of bleeding from the upper gastrointestinal tract. It is also more accurate than X-ray films for detecting inflammation, ulcers and tumors of the esophagus, stomach and duodenum. Your doctor might use upper endoscopy to obtain a biopsy (small tissue samples). A biopsy helps your doctor distinguish between benign (non-cancerous) and malignant (cancerous) tissues. Remember, biopsies are taken for many reasons, and your doctor may take a biopsy even if he or she does not suspect cancer. For example, your doctor might use a biopsy to test for Helicobacter pylori, the bacterium that causes ulcers. Your doctor might also use upper endoscopy to perform a cytology test, where he or she will introduce a small brush to collect cells for analysis. Upper endoscopy is also used to treat conditions of the upper gastrointestinal tract. Your doctor can pass instruments through the endoscope to directly treat many abnormalities – this will cause you little or no discomfort. For example, your doctor might stretch (dilate) a narrowed area, remove polyps (usually benign growths) or treat bleeding. An empty stomach allows for the best and safest examination, so you should have nothing to eat or drink, including water, for approximately six hours before the examination. Your doctor will tell you when you should start fasting as the timing can vary. Tell your doctor in advance about any medications you take; you might need to adjust your usual dose for the examination. Discuss any allergies to medications as well as medical conditions, such as heart or lung disease. Your doctor might start by spraying your throat with a local anesthetic or by giving you a sedative to help you relax. You’ll then lie on your side, and your doctor will pass the endoscope through your mouth and into the esophagus, stomach and duodenum. 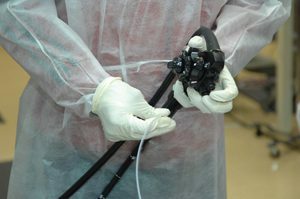 The endoscope doesn’t interfere with your breathing. Most patients consider the test only slightly uncomfortable, and many patients fall asleep during the procedure. You will be monitored until most of the effects of the medication have worn off. Your throat might be a little sore, and you might feel bloated because of the air introduced into your stomach during the test. You will be able to eat after you leave unless your doctor instructs you otherwise. Your physician will explain the results of the examination to you, although you’ll probably have to wait for the results of any biopsies performed. Although complications can occur, they are rare when doctors who are specially trained and experienced in this procedure perform the test. Bleeding can occur at a biopsy site or where a polyp was removed, but it’s usually minimal and rarely requires follow-up. 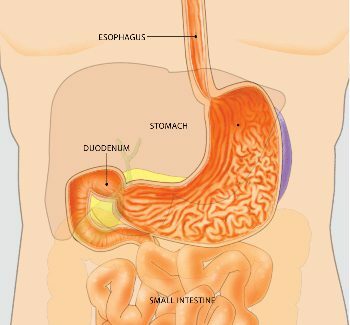 Perforation (a hole or tear in the gastrointestinal tract lining) may require surgery but this is a very uncommon complication. Some patients might have a reaction to the sedatives or complications from heart or lung disease. Although complications after upper endoscopy are very uncommon, it’s important to recognize early signs of possible complications. Contact your doctor immediately if you have a fever after the test or if you notice trouble swallowing or increasing throat, chest or abdominal pain, or bleeding, including black stools. Note that bleeding can occur several days after the procedure.